Device Name: Honor View20, also known as Huawei Honor V20 in China. Availability: December 26, 2018 in Beijing, China. Global Launch: January 22, 2019 in Paris, France. India Launch: January 29, 2019 in Gurgaon, Haryana. Colors: Available in Sapphire Blue, Magic Night Black, Phantom Red & Phantom Blue. Box Contents: The usual Quick start guide, Warranty card with SIM ejection tool, a 22.5W Huawei Super Charger, a USB-C to USB-A cable and, of course, a transparent silicone case. Question: Does Honor View20 comes with Plastic or Metal Body? Answer: Crafted by Metal frame with ultra-reflective curved rear glass with The V-shaped reflective pattern at the back. Question: What's the V-shaped reflective pattern in Honor View20? Answer: Honor View20 is the first smartphone to use Nano-lithography. Nano-lithography allows for creating a nano texture. The fourth generation of nano-vacuum coating and invisible aurora texture process create a vivid and dynamic V-shape color gradient with gleaming effect Aurora Nano texture, Aesthetics in Motion. 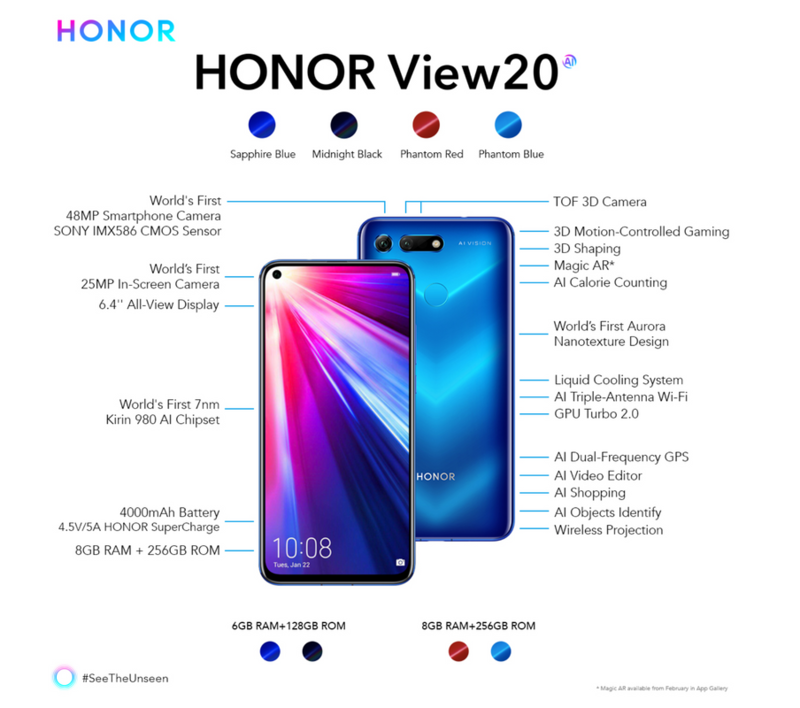 Question: What's the measurement of Honor View20 with weight? Question: Where's the SIM Card tray placed on Honor View20? Answer: The left side houses the dual nanoSIM tray. Question: Does Honor View20 sports a notched display? Answer: Honor View20 comes with Innovative Punch Hole display instead of controversial notched displays. Question: Does Honor View20 comes with LED notification light? Answer: Yes, it does comes with LED notification light at the top. Question: Where does the Fingerprint sensor is placed Front/Back? Answer: The Fingerprint sensor is Rear mounted and the device comes with Face Unlock feature as well. Question: Does Honor View20 comes with Capacitive buttons as well? Answer: No, Honor View20 comes only with On-Screen navigation buttons, supports the All-New Gesture Navigation System. Question: What is the Honor View20 display size & pixel density? Answer: It comes with 6.4"inch FHD+ display with 1080 x 2310 pixels(398 ppi density) obtaining 91.82% screen-to-body ratio i.e '19.25:9' with All-View display. Question: What is All-View display? Answer: Full-View Display 3.0 All-View Display, The in-screen front camera is specially placed at the upper left-hand side, maximizing the viewing area of the full screen. Question: Honor View20 comes with what type of display? Question: Which Version of Gorilla Glass is used in Honor View20 for protection? Answer: The device comes with Aluminosilicate glass for screen protection. Question: Does Honor View20 comes with pre-applied screen protector? Answer: Of course, Honor View20 has pre-applied screen protector. Question: Does the Honor View20 support Adaptive/ Auto Brightness? Answer: Yes it does! The phone can boost brightness automatically in sunlight and dim the brightness all the way down to as low as 1.1 nits when needed. Question: How is the Sunlight legibility on Honor View20? Answer: Sunlight legibility is above average, while the Sunlight contrast ratio is very good. Question: Does Honor View20 comes with various Color modes & Temperature? Answer: Yes it does support various color modes like Normal, Vivid, Default, Warm & Cool. Question: What is the Battery capacity on Honor View20? Does it supports Fast charging? Answer: The Honor View20 is powered by a 4000mAh battery and it supports 4.5V/5A fast charging (22W Super Charge 1.0). For India it's 9V/2A charge support. Question: Does Honor View20 support Wireless Charging? Question: How much is the battery life on Honor View20? Question: Does Honor View20 supports Power Saving modes? Answer: Yes it does supports various modes like Performance mode, Power Saving mode & Ultra power saving mode. Question: How long it will take to charge from 0 to 100% with 22.5 W Huawei Super Charger? Answer: Huawei Super Charger on Honor View20 charges the phone up from a dead battery to 100% in one hour 12-15 minutes. Question: How much is the screen on time in Honor View20? Answer: Honor View20 can easily push up-to 7 hours of screen-on time. Question: What are the camera specifications of Honor View20? Rear Cameras - Honor View20 packed with 48MP Sony IMX586 with f/1.8 lens, 1/2″ CMOS size, 0.8µm, Quad-Bayer pixel binning, 78-degree angle. While the secondary camera is Sony IMX316 3D Time-of-Flight (TOF) sensor for depth & motion sense alongside with LED flash. Front Camera - 25MP Sony IMX576 with f/2.0, 27mm, A display hole camera. Question: What's the size of display hole? Answer: Honor View 20’s display hole is 4.5mm in diameter. Question: Does Honor View20 supports Aperture/Potrait Modes? Question: The front camera on Honor View20's is AI? Answer: Yes, It's 25MP AI Camera. Question: Does Front Camera has LED Flash support? Answer: No, but there is a support for Screen Flash while clicking selfies. Question: What's the Max ISO & Shutter Speed ? Question: What is the longest Shutter Speed? 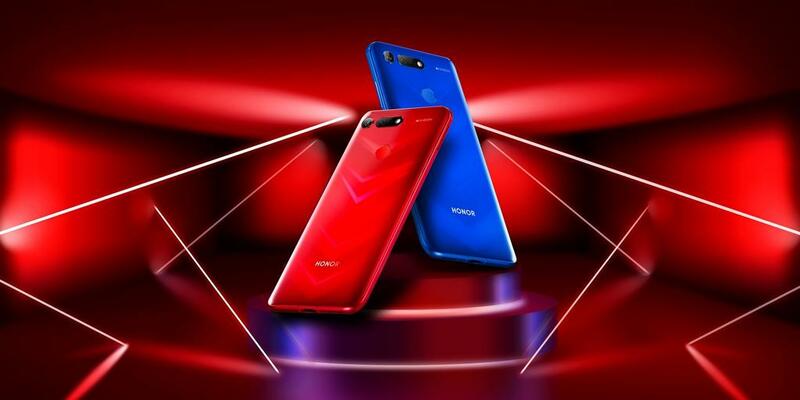 Question: What are the technologies used in both the front & back cameras of Honor View20? Rear Camera - Powered by the SONY IMX586 stacked CMOS image sensor, which features 48 effective megapixels on a 1/2-inch sensor, delivering excellent image quality.The camera sensor has a Quad Bayer color filter array, to deliver higher sensitivity and resolution, by producing adjacent 2x2 pixels in the same color. 48MP AI Ultra Clarity Mode - When this mode turned on, the camera will take several 48MP frames at once. With advanced AI algorithm learning capability and image processing speed has improved 134% and 46%, thanks to dual-NPU and the dual-ISP enabled by the Kirin 980 chipset, Photo is assessed, details in dark areas are optimized, and colors are adjusted to appear more vivid. TOF 3D Camera - a TOF 3D camera and can travel for a long distance. 3D depth sensing camera, in measuring objects from a distance. TOF 3D camera has a higher FPS which enables it to continuously receive real-time signals which is important for applications such as 3D motion controlled gaming. Front Camera - In-Screen 25MP AI Camera, offers a high-definition selfie experience in both day and night lighting. Question: What's are the benefits of 3D TOF Camera? Master of 3D Photography - Depth Sensing, Skeletal Tracking, Real-Time Motion Capture. 3D Motion Controlled Gaming - Turn your HONOR View20 into a motion-controlled gaming console. Its 3D camera allows you to play 3D motion games like never before. 3D Shaping - Real-time video retouching is now available on HONOR View20. The 3D camera separates you from the background with multiple retouch levels for the perfect look in any situation. AI Calorie Counting - Measure food calories by volume with the TOF 3D camera. Question: What are all the AI Features available in Honor View20? 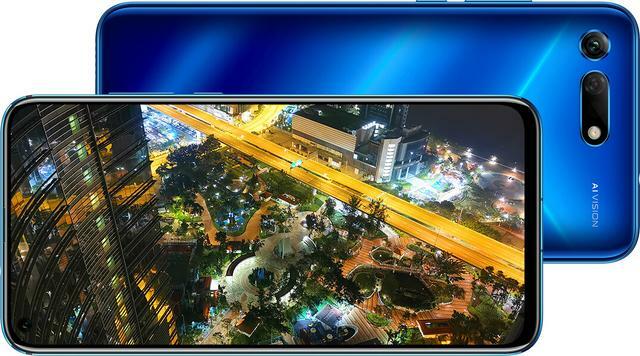 AI Super Night Shot - Incredible 48MP resolution, 4-in-1 superpixels and Artificial Image Stabilization (AIS) allow you to capture the night in a snap. AI Video Editor Director's Cut - The AI video editor can identify faces and create separate video highlights for individuals. Question: Does the camera outputs of Honor View20 is 12MP? Answer: Normally you are going to be shooting 48MP images binned down in a 2×2 area to give you 12MP outputs (12MPx4 = 48MP) unless you choose the new AI Clarity mode. Answer: Honor View20 can shoot videos in 1080p@30 & 60 fps and 4K@30fps, While the front camera does the shooting in 1080p@30fps. Question: Does Honor View20 can shoot 4K@60fps? Answer: Unfortunately, the Honor View 20 does not currently support 4K@60fps. Question: Does Honor View20 supports Super Slow Motion? Answer: Yes! The 720p@960fps Slow motion on HONOR View20 really slows things down so that you see things like never before and capture every breath-taking detail. Question: Does Honor View20 comes with any kind of Image stabilization? Answer: Honor View20 has inbuilt AI Stabilization. Question: What are the features of AR Lens in Honor View20? Answer: Honor View 20 features multiple modes that utilize AR to create GIFs and animated emojis, which the company calls it Qmojis. The multiple modes include – 3D Qmojis, Effects & Backgrounds. 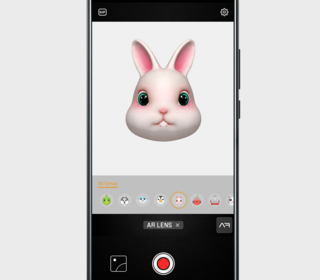 3D Qmojis - The Honor View 20 has various 3D animated emojis named – 3D Qmojis. These animated emojis feature all kinds of animal emoji, which utilize AR to scan your face and record those animated 3D Qmoji videos in 720p resolution. Effects - The View 20’s 48MP camera also has AR Effects with music-enabled with which you can create GIFs (can be recorded in 16:9 format) and can share them across social media platforms. Backgrounds - The View 20 camera can also shoot photos and videos with fancy AR-enabled backgrounds which include several stickers and notable cities monuments.